Part of our home décor range is our personalised decorative wall plate. 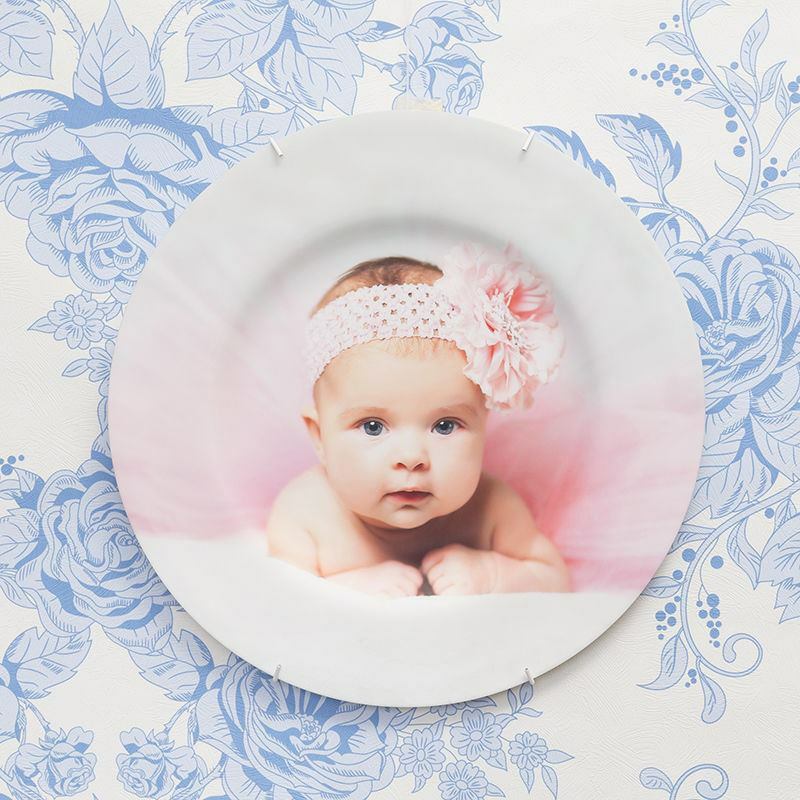 Use your creative designs or upload your favourite photos and adorn a wall space with custom wall plates printed all over. Design yours online now and make a cool gift. Wall plate decorations is an upcoming interior concept for home decor. From traditional images of flowers and creative art designs to personal photos of friends and family members, decorative wall plates can look stunning on walls and living shelves or sideboards. Our decorative wall plates also make great gifts for special occasions, house-warming gift, mother's day present, and Christmas gift. If you are looking for some inspiration on how to decorate wall plates, think about random patterns, montage of photos, overlapping patterns on plates, or have simple text and make a statement with your plate for your wall. Our specialist technicians use a digital printing method which permanently bonds the eco-friendly inks deep within the fibres of the material. This ensures that your print is permanent and that all photos are reproduced to the highest possible quality. The brilliant white base tone of these ceramic plates ensures that your colours look as vibrant as possible. Everything is quality checked within our specialist quality control department before being carefully wrapped and shipped out to you. Create a personalised decorative wall plate to commemorate a special event. Perfect for the face of new babies, graduations in cap and gown, milestone birthdays and so much more. Gone are the days when you are limited to the specific designs that you can find in the shops. Design your own personalised wall plate to display exactly what you want to, proudly and in a classic way. These custom wall plates look fantastic with a single photo, which you can add text to as well. If you would prefer you can create a photo collage on these wall plates too. Choose your own background colour, and design everything exactly the way you want it. When you are creating your decorative wall plate, please take note of the bleed area within the design interface. You need to ensure that your image fills the whole area, otherwise, you will end up with uneven white edges and you will find that your final print is likely to be off-centre. Quality matt photo canvas prints on excellent materials including anti-warping stretcher bars. Comes with 8 wedges, and fixings. Will not scratch. Make a printed glass desk frame with your photo. The photo is printed directly into the coated glass so there is no paper print to insert. Keeping track of time couldn't be anymore fun. Our personalised round photo clock is an ideal gift to your empty walls. Personalised wall clocks.